Very basically, a patent gives sole right to a process or invention for a stated period of time (14 years until 1920, 16 years after 1920). It protects the patentee from others using or selling the invention without permission. I didn’t think they would have much research potential as I presumed that they would only contain minimal details, to protect from imitations. However, as I started to do more reading, and had a look at some patents, I realise they could be very interesting. The history of patent law is, in itself, fascinating (see http://www.ipo.gov.uk/p-history.htm for a general overview). Their value, obviously, lies in scientific or technical research, for example tracing the development of a particular technology. They could also be used for family or local history, to find out about particular inventors (patents can generally be searched by number or name).The Intellectual Patent Office adds patent specifications to the Esp@cenet database, so far this dates from 1890 (but not full coverage). The British Library has produced a guide to searching Esp@cenet here. See also the National Archives' pages on 'Inventions: patents and specifications' for where, and how, to search. The patents of most interest to me are the ones which have survived in business collections. These are the ones which the business had a particular interest in keeping, most likely because they worked the invention. Alongside financial papers, licenses, minute books etc, they can be a real insight into the technological processes which a company chose to use, areas of special concern at particular times, and the effect the patent had on the company (e.g. monopoly over certain processes, increased productivity or profit). The records of Vivian and Sons Limited, held at West Glamorgan Archives (the first collection catalogued for Powering the World), contains a few letters patent kept by the company (ref no D/D YIM/3/1) one of which is the image above. 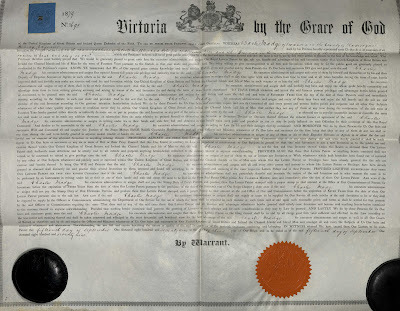 The Richard Burton Archives also holds a number of letters patent, patent specifications and related correspondence in the records of Old Castle Tinplate Company (ref no LAC/87/G) and Yorkshire Imperial Metals (ref no LAC/126/F). I found the chapter on patents in 'Business Documents: Their origins, sources and uses in historical research' (John Armstrong and Stephanie Jones, 1987) really useful. It details the background behind patents, their uses, limitations, examples of works using them, and how they can be cross referenced with other documents.